Piero della Francesca (1416/17-1492) was a Renaissance artist and mathematician, perhaps because of his interest in mathematics his paintings are noted for their perfect perspective and the solid, almost sculptural, quality of his figures. Art historians often cite the way he painted his figures as being directly influenced by Masaccio, regarded by many as the first (but short lived) Renaissance painter, whose paintings he would have seen in Florence. Piero della Francesca is claimed by both the Tuscans and the Umbrians as one of their artists because the town where he was born, Borgo San Sepolcro (now San Sepolcro), was sold by a pope to the Tuscan dukes when he was short of money. Piero della Francesca is probably not as well known as he should be because most of his paintings are in out of the way places. Many were commissioned by Federigo di Montefeltro, the Duke of Urbino, Urbino is a small town in the Marchè that was transformed into a Renaissance court by this cultured mercenary captain. Two of his paintings are still there, the Flagellation of Christ and the Madonna di Senigallia, but his famous portrait of the Duke and his wife, Battista Sforza, are in the Uffizi gallery in Florence. Others are still in situ in Sansepolcro, Monterchi and Arezzo and it is possible to easily see all of these in a day if you are based on the Tuscany Umbria border near the Upper Tiber Valley, Lake Trasimeno, Cortona or Arezzo. 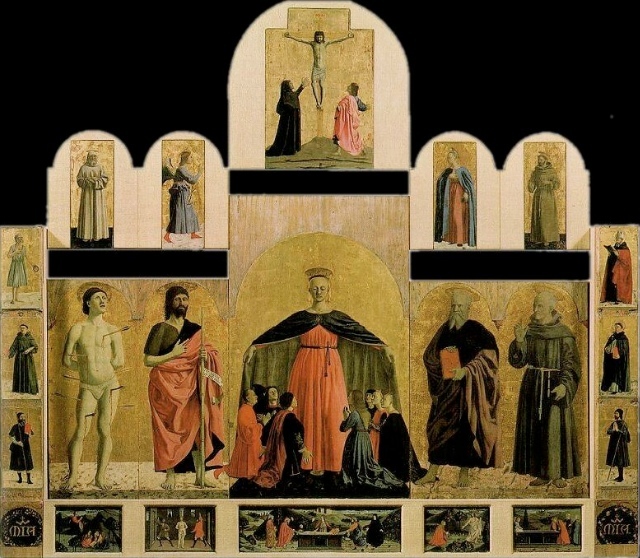 There is another incredible altarpiece in the Galleria Nazionale dell’ Umbria in Perugia but it would be too much to try and fit this in to a one day excursion, it’s best to visit Perugia and Urbino on separate days to complete the trail. I’ll write as if you are starting the trail in Sansepolcro, then visiting Monterchi and Arezzo but feel free to reverse the order of towns. Note that you have to book a time slot to see the frescoes in Arezzo, otherwise you may not be able to get in, you are asked to arrive 30 minutes before your viewing so allow plenty of time to park and make your way to the church of San Francesco. Once at Sansepolcro park outside the town walls and head into the centro storico, following signs to the Museo Civico. 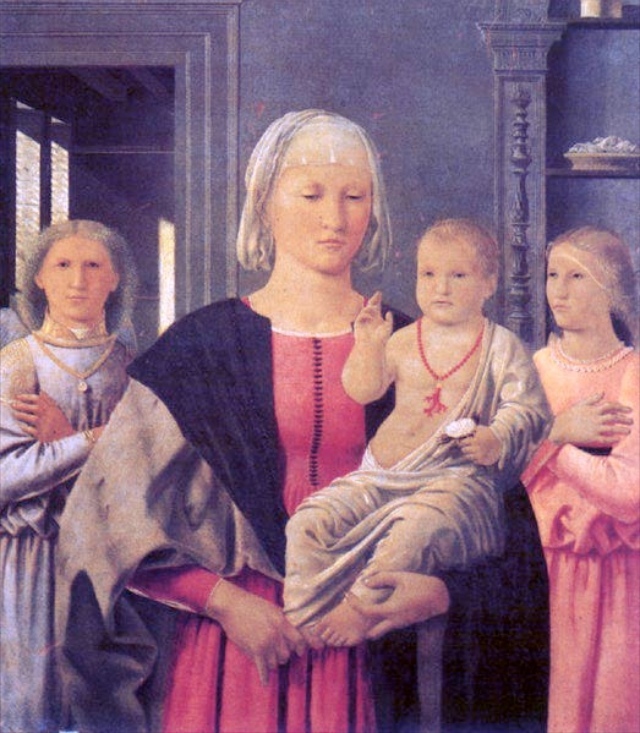 Sansepolcro still has two of Piero della Francesca’s works, the Resurrection of Christ fresco and the Madonna della Misericordia, an altarpiece. Described by Aldous Huxley as “the greatest painting in the world” Piero della Francesca’s Reurrection of Christ is still in place in the exact spot where it was frescoed onto the wall. the painting is heavy with the symbolism of re-birth and renewal, The pink tinged clouds of the dawn mirror Jesus’ cloak as he emerges from the tomb, look at the trees on the left of the painting, they are are bare whereas on the right there are in leaf. The broad triangular base formed by the sleeping soldiers forces the eye upwards to the emerging Jesus who completes the top of the triangle. Jesus is painted as if we are looking straight at him, whereas we should should be looking from below, this deliberate trick of perspective serves to make him jump out of the painting. It is thought that the sleeping soldier without the helmet is a self portrait of Piero Della Francesca. Painted over several years for a religious order with traditional artistic tastes, the flat gold leaf background to this painting only serves to make the figures look more three dimensional. Unlike medieval paintings with flat gold backgrounds, the Madonna’s cloak with which she shelters members of the order is painted in perfect perspective. The heavily pregnant Madonna depicted in this fresco is quite unusual subject matter, very few other examples exist. Painted on a wall of the cemetery in Monterchi, the fresco was moved in the 199o’s to the old school building which has been converted into a one painting museum, much to the benefit of Monterchi’s tourist industry. The fresco is a great example of less being more, two mirror image angels draw back the curtains of a tent to reveal the heavily pregnant Madonna, who stands supporting the weight of her child with her left hand on her hips and the right hand on her belly. The opening of the curtains and the slit allowing the front of her dress to expand could be construed as symbolic of the birth that is shortly to come. 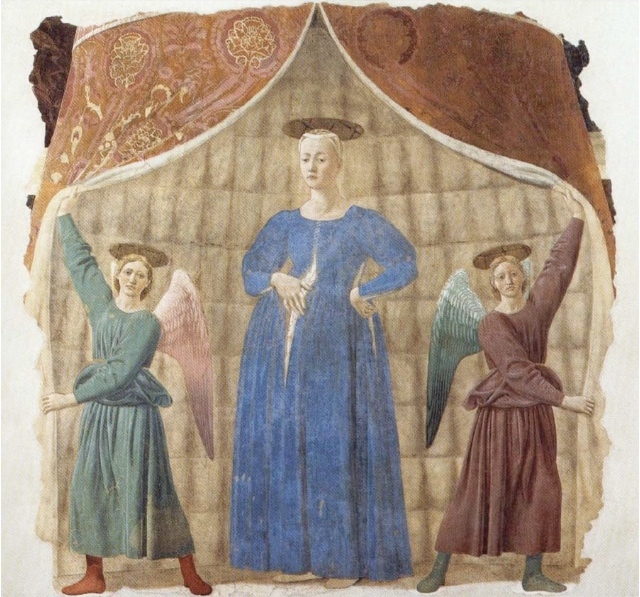 It is said that Monterchi was associated with a fertility cult and Piero della Francesca’s mother was from the village, so it is quite a suitable location for this painting. This fresco cycle is one of the great masterpieces of Renaissance art. the story is a convoluted medieval tale telling the story of cross on which Jesus was crucified. It starts with the death of Adam and an acorn being planted in his mouth from which the tree grows. Instead of following a chronological order, similar scenes from this tale are juxtaposed on opposite walls of the apse, for example, the battle scene of the Byzantines defeating the Persians in the 7th Century is opposite the scene depicting Constantine’s victory at the Milivian Bridge over Maxentius in the 4th Century. Higher up, you can see the Queen of Sheba recognising the power of the tree that the cross is later to be made from when she tries to cross the bridge it is made from. This is juxtaposed against Helena, Constantine’s mother, using the cross to resurrect a dead man. Note in a scene on the back wall of the apse, the angel visiting Constantine in a dream to tell him to paint the sign of the cross on his army’s shields, the composition has a remarkable similarity to the Madonna del Parto. From San Francesco, it’s a short walk uphill to visit the Duomo where you will find a small fresco of Mary Magdelene with her oil container on the left hand wall.